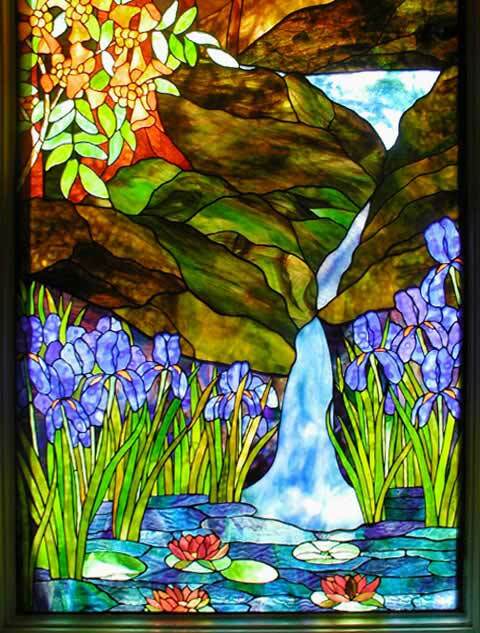 Waterfall Landscape Stained Glass Window Custom Glass Design. "LANDSCAPE" STAINED GLASS SCENIC WINDOW WITH TREES, WATERFALL, IRISES AND LILYPADS, CUSTOM GLASS DESIGN CREATED BY JACK McCOY©. 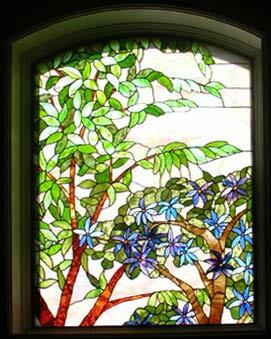 Multiple layers of stained glass were used to achieve the depths of color on this 13–½ foot by 3 foot window unit. This stained glass landscape window of trees, waterfall, irises and lilypads was designed and fabricated by Jack McCoy© for a staircase landing of a residence in Austin, Texas.